Syiah Kuala University (Unsyiah) and the Institute of Indonesian Cultural and Arts (ISBI) Aceh held an interactive dialogue about the admission of new students in the National Selection for State Universities Entrance (SNMPTN) and the Joint Selection for State Universities Entrance (SBMPTN) in 2019. 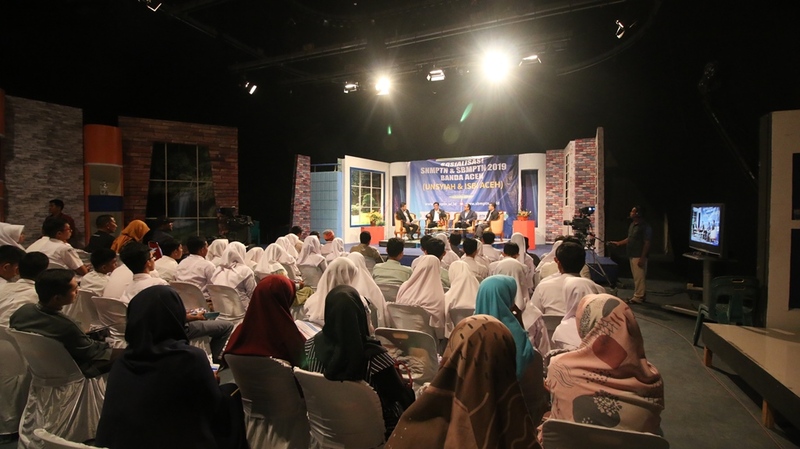 This interactive dialogue took place in the studio of TVRI Aceh, Tuesday (2/12) and broadcast live to all of Aceh. This activity presents three presenters, Prof. Dr. Ir. Samsul Rizal, M.Eng (Unsyiah Rector), Prof. Dr. Ir. Marwan (Deputy Rector I Unsyiah), and Dr. Ir. Mirza Irwansyah, MBA. MLA (Rector of ISBI Aceh). The activity, which was attended by dozens of Banda Aceh and Aceh Besar High School students and teachers, aimed to provide an overview of the students admission. Unsyiah's rector hopes that this interactive dialogue can help schools and students in the SNMPTN registration, which has only a few days left. "We urge schools and students to register immediately. Don't wait for the end of time, because in those days it is likely to be difficult to access the registration page. " Rector also mentioned many differences in the new student admission system this year. For this reason, he hopes that students can peruse each admission information. This is intended to minimize errors that can harm prospective students.